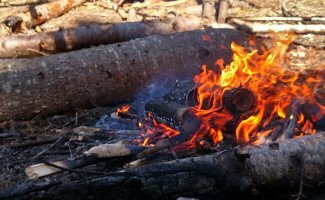 During my semester at Jack Mountain, I kept a blog on my personal site, Primitiveaddictions.com, and over the next few weeks, I’ll be reposting those pieces here on the Jack Mountain Bushcraft School blog. My hope is that anyone considering taking a course will get some insight into the day to day workings of a semester length outdoor skills course. Thanks for reading, and I look forward to seeing some of you on the trail! Well, it’s been just shy of a month since I started the semester here at Jack Mountain Bushcraft School, and I’ve got to say, it’s been pretty incredible. In these few weeks I’ve been in every environment you can think of, water, woods, snow etc. I’ve learned a metric ton of skills and met some really interesting folks. I wasn’t sure how to approach an article summing up the time here so far, so rather than regale you with all the little practical skills we’ve covered I’m going to pick a few projects and talk about them a bit. This one is obvious, but if I’m honest, most of us take the ability to create a heat/cooking/light source completely for granted. We started off learning how to make effective “twiggy bundles”, dense bundles of tinder that can be lit with one match and used to start a much bigger fire. Afterward we moved on to a concept called “feather sticks”, and finally on the first rainy day, we had a one match fire in the rain. The goal of all of these is to create a bunch of much smaller surface areas for the match to set fire to, and then once you’ve got a small fire going you can increase the size of the firewood step by step. Think about the last time you lit a campfire or even one in a fireplace at home. How many matches did it take you? Or did you just use a lighter? That’s what I mean by “taken for granted”. We went through a test with each of the methods we learned, and we’re only allowed one match. I failed both the twig bundle and feather stick tests the first time. No matter how much I read and understood conceptually what we were aiming for, it took trial and error for me to work through all the hiccups. Windy? Better learn to cup the match in your hand better to keep it from blowing out. Wet starter fuel? Better take the extra time to increase the surface area even more. Fire has been my biggest struggle so far, and it frustrated the hell out of me, because it’s the basis for so many other necessary skills around camp. However, now that I’m in the swing of it, I MAY be too excited every time I get to start a cook fire. If you’ve read anything I’ve written before, you know that woodcarving and woodworking, in general, are very personal hobbies to me. I use it to blow off steam and settle into a comfortable mindset when things in life get out of hand. I also adore boats and being out in the water for the same reasons. So when we started carving our paddles I let my experience and a bit of ego get the better of me. “Finally, something we’re doing that I already have some experience with”, I thought just before reality slapped me in the head with a canoe paddle it had carved just for the occasion. Hand carving a canoe paddle is not like making a table, or relief carving a design. It’s a slow, methodical process that can’t be planned out entirely. You start out with an idea in your head, but things come up as you carve that force that idea to change. The grain of the plank changes or a knot goes through it in a way you hadn’t expected. It was a really great experience, but definitely reminded me that I’m here to learn, not keep doing what I already know how to do. Look. I am not a great cook. I can make a few things well, but I’ve been spoiled by being around people who’re better at it than I am, and love cooking. Planning out meals for a day up here is no mean feat. Do you want rice to go with lunch? You should probably start a fire and get water boiling at least twenty minutes before you plan on cooking. No electricity means you have to add the time it takes to heat things up into account. We also have a lot of staple foods, that after a week can get sort of tiring. (Rice, oats, ruly flour etc) So you start thinking of different ways to cook them, and experimenting with spices and weeds from the garden (I’ll definitely have to write an article about edible “weeds”. You haven’t lived till you’ve made soup with dock leaf and dandelion leaves you pulled out of the garden.) The whole experience has made everyone here much more cognizant of how and what we eat, even caused some interpersonal tension as people started cooking for themselves rather than waiting to make a big group meal. (There’s an article in the works on the interactions of the group of men here. We’ve gone from joking for a week straight, to having a stretch of days where everyone is on each other’s raw nerves, then straight back to joking around. The “soft skills of group management are definitely an art all of us hoping to become guides will have to wrap our heads around.) I’ll be honest though, I’ve got a feeling I’ll have extra time for the first few weeks after the course because I promise I’ll forget that the oven doesn’t take half an hour to heat up. Thanks for reading, and as always, if anyone has questions about the article or the program I’m in please don’t hesitate to ask.